I was off line for the New Year so a belated Feliz Año Nuevo to you all. And whilst my in-laws have no Internet access, they do have SKY so I was able to see in the New Year at 11pm GMT with those in the Puerta de Sol in Madrid on TVEi – and eat my ‘uvas de la suerte’ just like Gretel (clever pooch!). I discovered that, as well as ensuring you eat all 12 grapes to ensure your good fortune, your underwear has a deciding factor in your luck for the coming year. If you wear red undies, apparently it will bring you good luck and love. In Mexico, if you carry a suitcase onto your balcony, you’ll go on lots of trips, and by putting money on you windowsills, you won’t be short of money. If only ….. Tomorrow it will be El Día de Reyes in Spain and other Hispanic countries, the day on which presents are traditionally delivered by the Three Kings. Epiphany is a big deal in Spain with parades called cabalgatas in most towns when the Reyes Magos arrive on their camels (or sometimes in a boat in Barcelona or Málaga) on the evening of the 5th before distributing presents overnight into the waiting shoes left out on balconies with some straw for the camels. For photos, check out El País.com where there are a number of good quality pictures from 2007. There are a number of clips of these processions on Youtube – there is a slideshow from Priego, Córdoba with stills and short clips of their parades accompanied by an interesting music (!) and one from Rociana in Huleva features some very generous Reyes who are throwing rather large parcels instead of the usual sweets into the crowd. I also came across a couple of amusing videos. The first is El rap de los Reyes Magos in which they plot (and execute) the downfall of Santa who is increasingly taking over present giving duties – not recommended for use with young children! And the second below is entitled Los padres son los Reyes Magos. On the subject of presents, there’s a short voxpop clip in Spanish about the cost of buying presents for Reyes – good for more confident learners or for gist. Perhaps listen out for presents, or for the number of children / grandchildren people have, or even for cognates. A good discussion starter.That’s a bit tricky for younger learners, but they could write simple letters to los Reyes with their present requests – two sites to do this online are El Boricua from Puerto Rico and espacio.ya.com – in English or Spanish – or even draw and label them. There are numerous sites with information about Reyes – have a look at my del.icio.us tabs on the right under reyes – including recipes for the traditional ‘Rosca de Reyes‘ and some activities from Tucson Children’s Museum (a couple of the links are dead unfortunately). And what would a festival be without a song – here’s one version of ‘Aquí vienen los reyes’ – the words seem sweet but unfortunately there is no music but the more usual version seems to be this one. As the site points out, it’s a bit odd as it suggests that the Reyes Magos can see Holland – either they have very good telescopes or they’re very lost ;o) There’s a .mp3 file with this one – always helpful if you want to use it and have no idea how it goes – but here’s another version by Rayito ‘con sabor flamenco y rumba’. If you’re interested in French resources for Epiphany, Jo Rhys-Jones has provided some ideas and links on Talkabout Primary MFL. 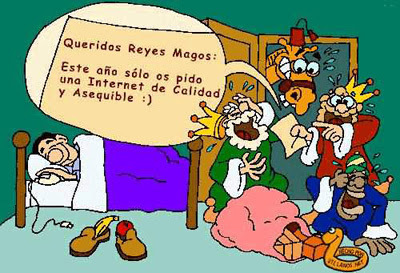 And, as the prospect of returning to work dawns, this cartoon sums up my request to the Reyes Magos … ¡Felicidades!